I was surprised to realise that I hadn’t written up this recipe before now! 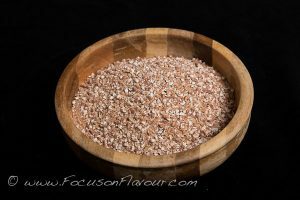 Buckwheat is a fantastic whole food, a seed rather than a grain, and good for people who are trying to avoid gluten. As well as being rich in complex carbohydrates, it is also a useful protein source, and as we are trying to encourage each other to include more plant-based protein in our diet, this is a great food to discover, if you aren’t already familiar with it. 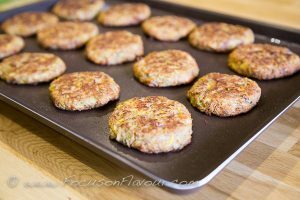 Buckwheat burgers are simple to make, cheap and delicious to eat. They make a great vegan fast day meal. 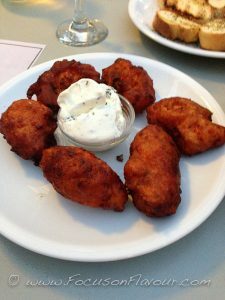 They are splendid stuffed into a piece of pita bread, with or without salad, tomato sauce or whatever other dressings you may fancy. They help to keep you warm all day in winter if you have one for breakfast. Try one with a fried egg, mushrooms and toast! Or have one or two for an evening meal with rice and vegetables. 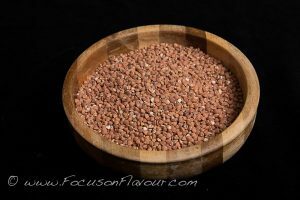 Mostly, buckwheat gets used as a flour here in France, to make galettes de Sarrasin. 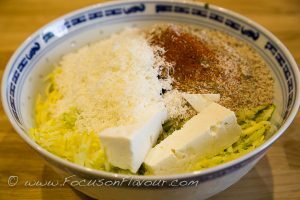 You may also come across it as soba noodles. Although it is also called blé noir (black wheat) it is not related to wheat at all. But I am not going to use flour, I am going to start with whole buckwheat groats. These ones are already roasted (kasha grillé), but if yours are not, they can be easily toasted in a dry frying pan over medium heat. Keep shaking the pan so that the groats move around and get evenly heated and just start to turn a little darker. This improves the flavour. Then they need to be roughly ground. The easiest way to do this is in a food processer, blender or grinder, but I guess you could do them in a pestle and mortar for you arm exercises…. You want to have some texture, not create a fine flour. A few pulses in a good blender will suffice. Next, put into a bowl and add boiling water and mix with a fork, until the mixture holds together. If it is too dry, it will be crumbly. Cover and leave this to rest for a few minutes, to cool and absorb the moisture. Then form into a smooth ball, adding a little more water if necessary. 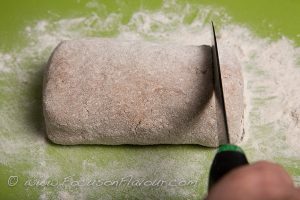 Put onto a floured board (using some buckwheat or wholewheat flour) and roll into a fat sausage shape. Slice into 8 rounds, about 1cm thick, dusting with flour as you make them. These are then fried in a little oil until nicely browned on both sides. Then pour some tamari soy sauce into the pan and let them sizzle, flipping them over and adding a little more tamari if needed. This gives the crust a lovely savoury flavour. 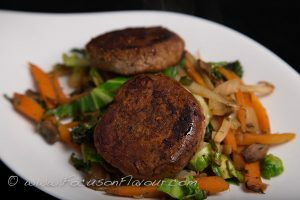 A super vegan low calorie meal, suitable for a 5:2 fast day: 2 burgers and a heap of stir fried veggies will be less than 300 calories. 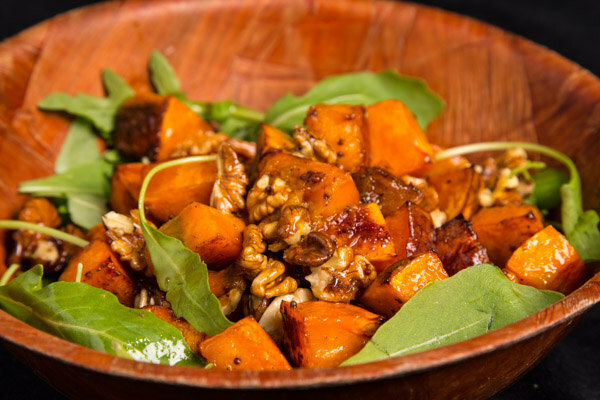 Include some chopped nuts, sunflower or sesame seeds or a tahini dressing to increase the protein content. You can freeze them uncooked – open freeze and then wrap individually. Defrost before cooking. Really, very little effort and it is hard to figure out why they aren’t better known! I think this way of making them is much more successful and tasty than boiling the grains, or pre-soaking them. 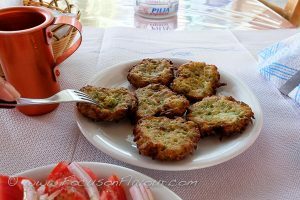 One of my favourite discoveries last year, when I visited Greece, was Kolokithokeftedes – Fried Zucchini/Courgette Fritters. A delectable mix of crispy outside and soft interior. Returning home, I dug out a few recipes and inevitably, made some changes to come up with my own version, that fits in well with a Mediterranean style diet and one that is full of vegetables, nuts and, very importantly, FLAVOUR. These are great fried, but actually easier to make and probably healthier too, if you bake them. 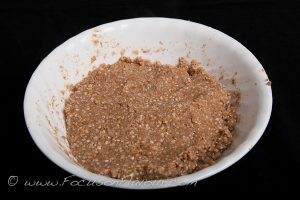 Instead of breadcrumbs, I use ground almonds, which help to make them more protein-rich and lower in carbs. 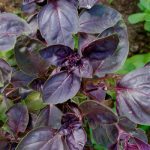 You can vary the herbs and spices, but for me, mint and basil or oregano, along with freshly toasted and ground cumin and coriander, plus a little smoked paprika, have become the favourites. Add some finely chopped chilli for a bit of a hot kick. 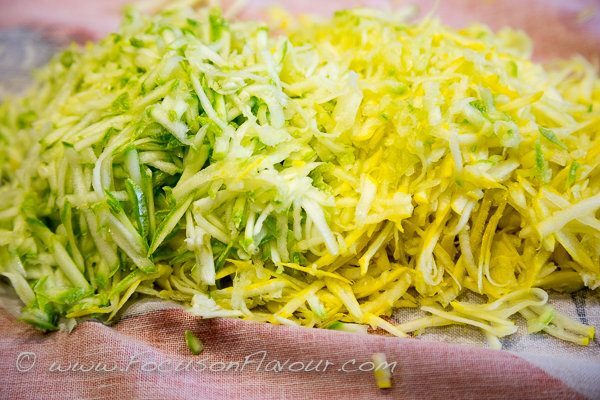 This is good with larger courgettes too, though for the best flavour and texture I choose medium sized ones – up to about 15cm long. 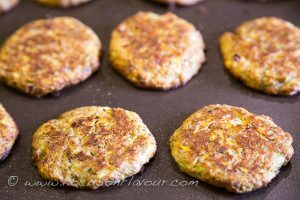 You can use any summer squash, as shown here, I have used a mixture of yellow patty pan squash and courgettes. *It’s important to remove moisture, so after grating them, I lay them on a cloth and then gather it up into a ball and squeeze out as much liquid as I can. Mix all the ingredients, except the olive oil, in a bowl. Heat the oven to 200c. Spray or brush a non-stick baking sheet with olive oil. 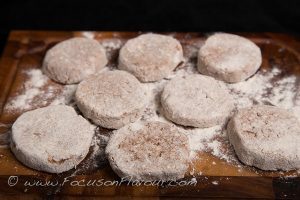 With damp hands, take about a tablespoonful of the mixture, form into a rough ball and then flatten into patties. Lay them on the sheet and finally spray or brush very lightly with a little more oil. Bake on the top shelf for 25 to 30 minutes, turning half way through. Heat a non-stick frying pan over med-high heat and add enough olive oil to just cover the base. Using a damp spoon, put spoonfuls of the mix into the hot oil and fry on both sides/all over until nicely browned. In Greece I have seen them all shapes and sizes, so go with what suits you! Either way, lay onto some paper towel to absorb any extra oil. Serve hot, warm or cool. Delicious served with Tsatsiki (Yogurt and Cucumber dip) and/or a Tomato and Chilli Salsa. A lot of people know that I love to grow tomatoes. A lot of tomatoes. Lots of different varieties. This year I think I have about 60 plants of 20 or so different sorts. Not only do I love to eat a simple tomato salad, I like to have enough tomatoes so that I can avoid buying canned tomatoes or pizza or pasta sauce altogether. 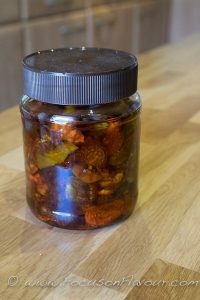 I also generally find that those you buy from the supermarket are pretty tasteless, especially out of season, so I prefer to use my own frozen or sundried tomatoes instead throughout the winter and spring. With the smaller tomatoes, I generally sundry them and then store them in olive oil. I find they only need 2 or 3 days in the sunshine. Cut them in half, lay them cut side up on a tray, sprinkle with sea salt. I usually put a wire rack over the top which keeps flies off successfully. Leave them in a sunny spot, but bring them in overnight or if there is any hint of rain. If it looks like they aren’t going to get fully dry because of poor weather, they risk going mouldy, so then I finish them off in the oven – at about 80c until they are the texture I like, which is still kind of soft, but crinkled, what the French would call mi-cuit. If you don’t have sunny weather at all, you can do the whole thing in the oven, or you could use a dehydrator. But I think the sunshine gives the most flavourful results and the best texture. Once they are dried to your liking, you can store them in a jar of olive oil. I push in as many as I can fit in the jar and then pour in good quality virgin olive oil to completely cover them. Use a chopstick or spoon to ensure there are no air bubbles. I can get at least a whole tray full in one jar, so it is a good space-saving method of storing them. Keep them in a cool, dark place and I find they last at least a year and even two (on the occasions when I have made more than we get through). Another way of storing them that I am trying this year, is putting them in a ziploc bag and freezing them. I think this could be an excellent way of saving them to make a paste with later, or just to add them in to all sort of savoury dishes. Dress with a drizzle of vinaigrette made with olive oil, walnut vinegar, balsamic vinegar, grainy mustard, garlic, sea salt and pepper and scatter with some fresh basil or finely chopped mint. Add about 40 kcals for a tbsp of dressing (ratio of olive oil to vinegar 1:2). This makes a fabulous starter, or a light lunch. I really like it best with the soft goats cheese, like a buche fraiche (fresh log) that I can buy in the market, or the Petit Billy type of chèvre frais; but you could also use cabecou, or perhaps some sheep’s cheese like feta or buffalo mozzarella. 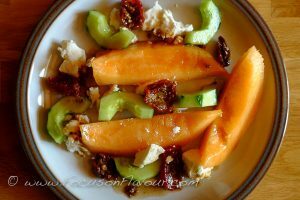 This recipe first appeared in my book Focus on Flavour: Recipes inspired by living in South West France. It’s getting to the time of year when most of my gardening time is spent watering and harvesting. The first wave of beans and the raspberries are now coming to an end, but tomatoes, cucumbers, courgettes, summer squash, Swiss chard and perpetual spinach are growing abundantly, and the first chillies are ripening. 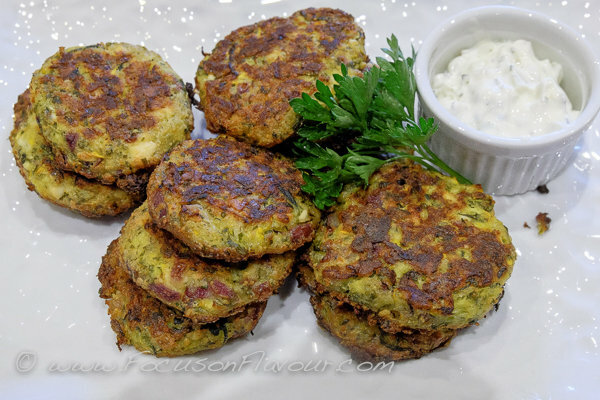 For these vegetables I’ve been trying out some new ideas, most of which I have captured on my Pinterest board – Seasonal Specials. I also have some fabulous Basil plants. 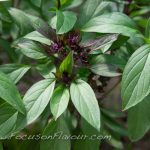 This year I have Purple, Sweet Green Genovese and Thai varieties. So, what to do when you have a fabulous amount of basil? 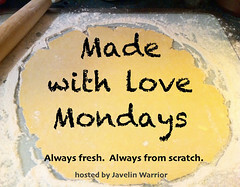 I make Basil Oil – it is wonderful drizzled over fish, chicken, anything with tomatoes, roasted vegetables, cheese…. 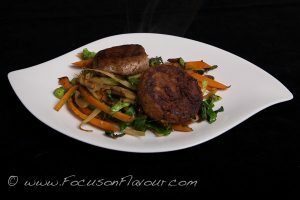 This and the other following recipes are from my first book Focus on Flavour. 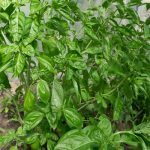 I came across this in a book by Annabel Langbein and it was an instant hit with me, because I adore basil and mourn the end of the growing season. 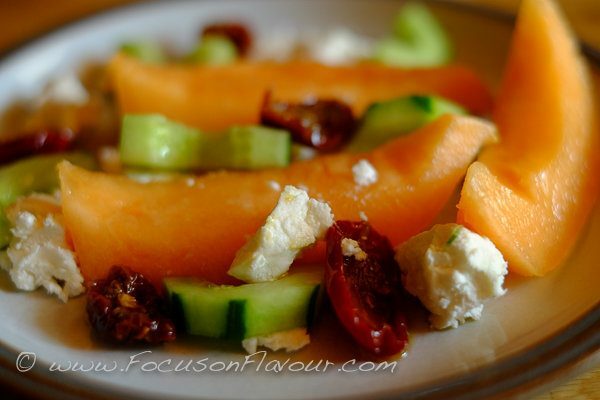 This is the perfect way to preserve the intensity of its flavour and colour. 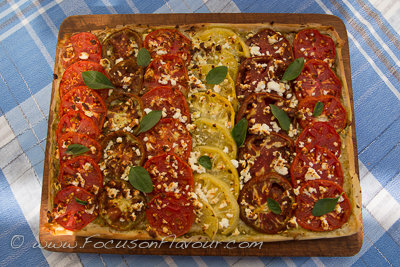 It gives a terrific visual lift to the Tomato and Feta Tartlets as well as giving its heady herbal warmth to chicken, fish, potatoes or other vegetables. Pour the boiling water over the basil leaves and immediately refresh under cold water. Drain well and blot dry with paper towel. Blend with salt and olive oil until smooth. Store in the fridge or freeze in ice cube trays. These little tarts are really yummy. A wonderful mixture of tastes and textures. You could use mozzarella instead of feta. Preheat oven to 200ºC. Cut out circles about 10cm diameter from the pastry. Lay onto a baking tray and prick the bottom with a fork. Chill for 20 minutes. 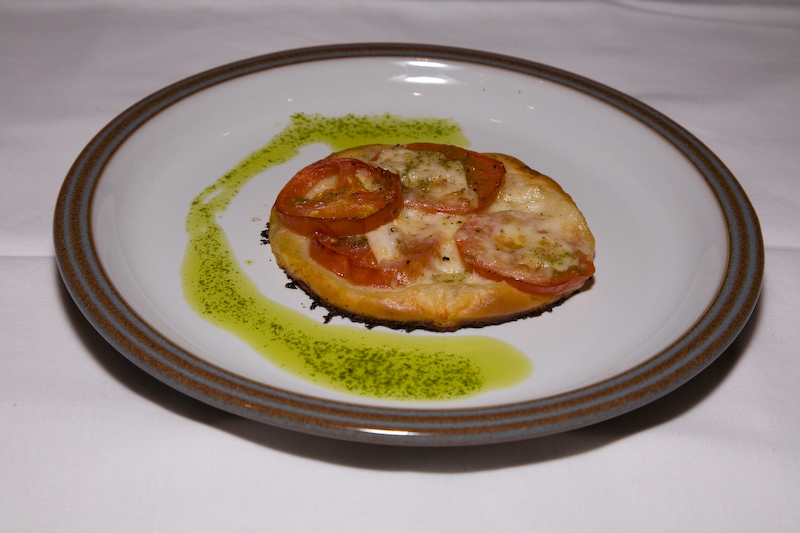 Slice the tomatoes and layer on the pastry, alternating with the cheese. Drizzle with basil oil and season well with salt and freshly ground black pepper. Bake for about 10 minutes until golden brown. Serve with a drizzle of basil oil on the plate. Until I discovered Basil Oil this was the only way in which I could capture the wonderful aroma of basil to use beyond the season when it grows fresh. 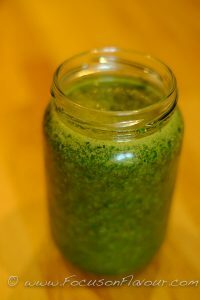 We have plenty of walnuts here, so I used them instead of pine nuts and I think they give the pesto a really fantastic flavour. It also tastes delicious without the cheese for vegans or those avoiding dairy products. I use this with pasta for a simple starter or lunch dish, mix it in to a vegetable soup just before serving, or spread over meat or fish (see Chicken Pesto Parcels). 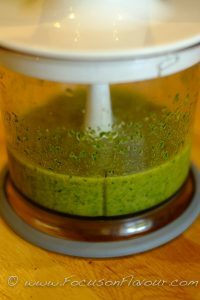 Put the basil, garlic, walnuts and salt into a blender with about half the olive oil to mix to a paste. Stir in the cheese, if using. Transfer to a screw-top jar and pour in extra olive oil to cover completely. Screw on the lid and store in the fridge. Mix well before using and recover any remaining paste with olive oil again. Keeps well. Cooking the chicken wrapped in paper helps to keep all the flavour and juiciness in. 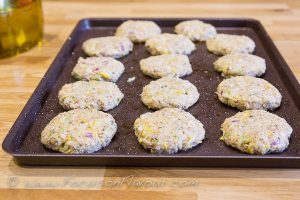 This is a great way to cook if you need to cater for different preferences – meat, fish and vegetarian parcels can all be cooked at the same time without transferring their flavours. Spread the pesto on the chicken. Lay the ham on top. Roll up each one and place into the centre of a sheet of baking paper, then fold up and seal into parcel. Bake for 30 minutes at 200ºC. Lovely served with braised endive in a cheesy sauce. I came across this recipe in a book about cooking on a canal barge by Kate Ratliffe “A Culinary Journey in Gascony”. 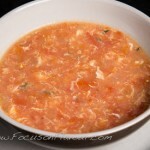 It makes a wonderful summery soup using loads of fresh tomatoes, but t it would be perfect for a fast day even in winter using tinned, bottled or frozen tomatoes. Adding an egg just before the end of cooking increases the protein content and gives added interest. I would serve this over some toasted bread rubbed with garlic for a non-fast day. 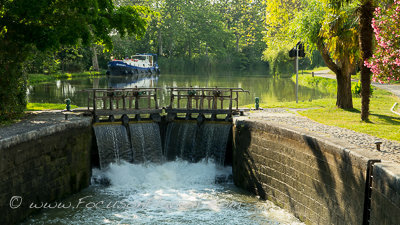 So imagine yourself cruising along the Canal du Midi and stopping to buy a big bag of misshapen Marmande tomatoes, and enjoying this for lunch…. 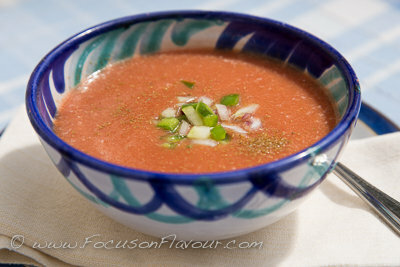 A wonderful tomato, onion and garlic soup, simple as you like, perfect for making the most of summer or with tinned tomatoes in winter. Add a beaten egg just before serving. Put the tomatoes, onion and garlic into a pan along with the water and season well. Bring back to a boil, beat the egg lightly and stir into the soup. Check and adjust the seasoning to taste. This recipe can be found in my book “5:2 Healthy Eating for Life“, available on Amazon in print or kindle format. Continuing my theme of working through the Christmas Leftovers…. I had one of those serendipitous moments when I picked up a cookbook (Ottolenghi’s Plenty More, a welcome Christmas gift), opened a page at random and realised that I had all the ingredients that I needed. Of course I couldn’t resist making some little changes… a little less oil, a little less richness by reducing the cream and quantity of cheese. So his Membrillo and Stilton Quiche has become Squash, Stilton and Quince Tart (too many Ss and Qs to leave it called Quiche…). 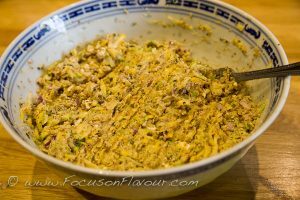 Continuing with my current passion for making my own pastry, I rustled up some light and crumbly shortcrust – but you can use ready made and it will still taste good. If you have a chunk of Stilton left, that is perfect for this. Actually I was surprised at how mellow it became after cooking, perhaps because I am more accustomed to using Roquefort as a blue cheese, which is indeed a good deal more tangy. That or any strong blue cheese would make acceptable alternatives. Perhaps you are lucky enough to have your own Quinces and have made yourself some Quince Paste or Jelly or Cheese, or have been given some for Christmas? I find it keeps well for months in the fridge, but it also freezes well. You may find it in the Spanish section of a store as Membrillo, or in French it is called Pate de Coing. If you don’t have any you could perhaps substitute some other thick fruit jelly or I thought of using some chunks of stoned dates. Failing that, some chunks of peeled pear could be an interesting match, but the sticky sweetness of the quince paste does work beautifully. 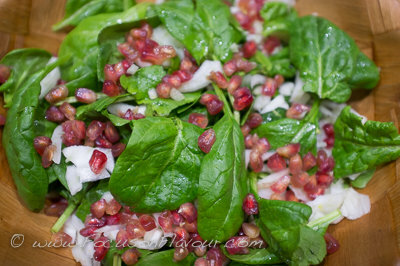 I served it with a lively ‘tricolour’ salad of young Spinach leaves with finely shredded Fennel and topped with Pomegranate Seeds, drizzled with a balsamic vinaigrette. Absolutely delicious seasonal fare. 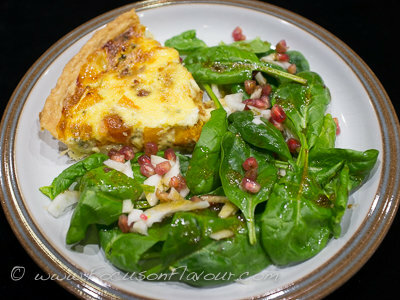 Each serving only 410 calories for the tart and 72 for the salad, so this could even be a meal on a fast day. A luscious mixture of mellow blue cheese and sumptuous quince jelly adorns the golden cubes of squash in this festive season tart. Preheat oven to 200c (fan). Cut the squash into smallish cubes, about 2cm, spread on a baking tray and toss in the olive oil. Bake in the oven for about 30 minutes, turning half way, until soft and starting to brown at the edges, then leave aside to cool. Chop the butter into the flour and salt and then rub together until like breadcrumbs. Add enough cold water to just form a dough. Roll out thinly in a floured surface and transfer to a lightly greased or non stick 24cm flan dish. Leave to chill in the fridge for about 20 minutes. Turn the oven down to 180c (fan). Cover the pastry with baking parchment and beans and blind bake for about 10 minutes, then remove the paper and bake for a further 5 - 10 minutes until lightly cooked. Whisk the eggs with the cream and milk and season to taste. 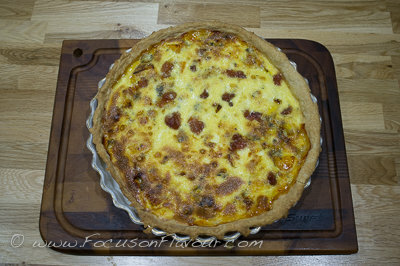 Distribute the squash over the pastry, then the stilton and pieces of quince jelly and pour over the egg mixture. Bake for about 40 minutes until set and golden. I found that 250ml of liquid and 3 eggs was a little too much for my 25cm flan dish, but I have left this quantity in case yours is a little deeper. You could add some herbs to the baking squash to vary the flavour. Try some chopped stoned dates if you don't have any quince paste. Some chopped walnuts or pine nuts would make an interesting crunchy addition. The calorie count for this recipe card is somewhat different from my own calculations. I'm not sure why! It is now a year since we started following 5:2 Intermittent Fasting. Wow. I remember how strange it felt that first day, going without lunch. Well nowadays, more often than not, I go without breakfast too and find it makes no difference to how hungry I feel in the afternoon. I still tend to get a dip, and a rumble or two mid-afternoon, but it doesn’t interfere with whatever else I want to do. I just have another cup of something and carry on. For my first anniversary fast day dinner, I’m going to use up some ingredients that I have in the fridge, which includes fresh leeks and carrots and an assortment of cheese. I also have piles of gorgeous nuts, which I love to have around the house at Christmas time. Some of these are walnuts from our own garden, which was a good crop this year. 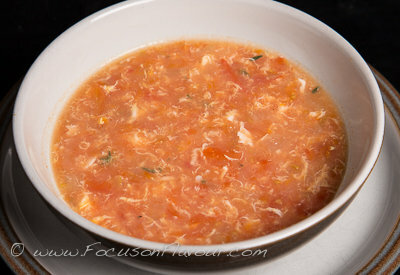 It is worth buying caraway seeds to use in this, they add a great flavour to the dish. They are handy to have with all kinds of cabbage dishes as well, they reputedly help with reducing flatulence! The recipe in my book serves 5, so I’ll probably freeze a couple of portions for another time (before cooking), as it’s just me for this meal. But I won’t mind eating leftovers! I have a lovely basket of small satsumas from Corsica that caught my eye when I went shopping, so dessert will be one of those, together with some of my first batch of home-made kefir yogurt. More about that another day. This is one of the recipes that I have included in 5:2 Healthy Eating for Life which is now available in print and kindle editions from Amazon. 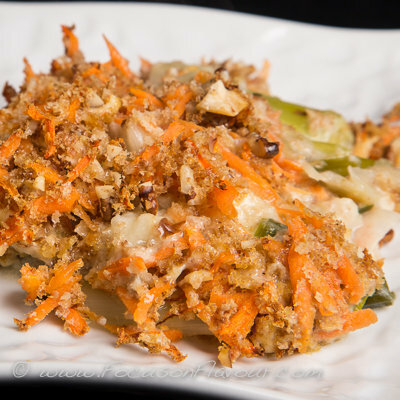 With the vegetables, milk, cheese, breadcrumbs and nuts, this has a good balance of ingredients. I used oddments of cheese that I had left – a little cheddar, some Comté and some crumbled blue sheep’s cheese, which worked fine, but you can use any hard cheese really. The caraway seeds add a really interesting flavour. Put the leeks in a saucepan with the stock or water and seeds. Remove the leeks with a slotted draining spoon and transfer to a baking dish. Melt the butter in a saucepan over medium-low heat. When it starts to froth, add the flour and mix well with a wooden spoon to make a roux. Remove from the heat and gradually add the liquid, beating well after each addition, to make a smooth sauce. Return to the heat and simmer the sauce for a couple of minutes, stirring all the time, to make sure that it doesn’t burn and there are no lumps. Bake in the oven for 20 – 25 minutes, until golden. 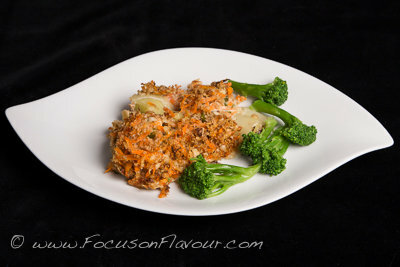 Serve with some fresh green vegetables, such as steamed broccoli. This chilled soup recipe is simply scrumptious and only 55 calories for a generous serving. I have avoided the bread and olive oil of my traditional recipe and can’t say I really miss them, I found that by blending until as smooth as possible and then sieving out the seeds, the end result is just as satisfying. 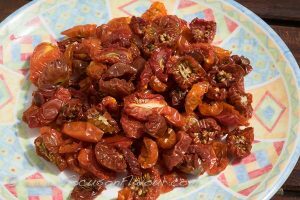 At this time of year, tomatoes are ripening quickly and this is a fabulous way of using them, especially if you are lucky enough to have a glut of home grown ones. The soup freezes well. 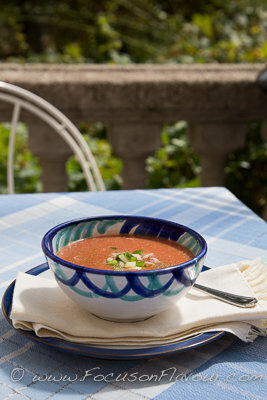 A light and delicious summer soup to serve chilled. 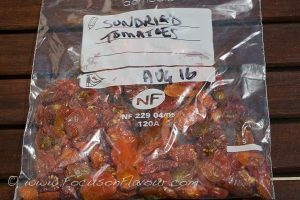 I have kept it to the barest and simplest, so you really need good sun-ripened tomatoes for the best flavour. 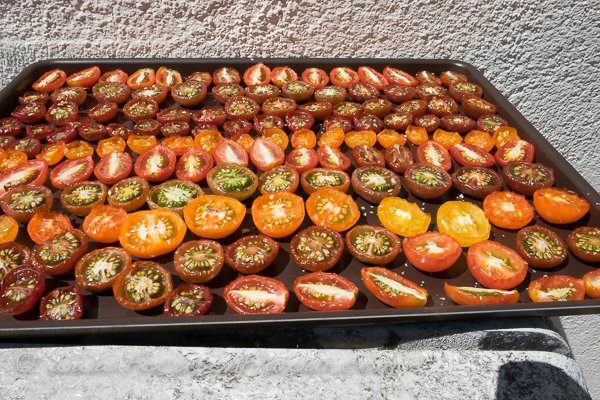 Score the tomatoes and put into a large bowl or pan, cover with boiling water, leave for about 30 seconds and then lift out with a slotted spoon and leave to cool (you might need to do this in two batches). Remove the skins and cut out the cores, chopping the remaining flesh roughly. Finely the cucumber, pepper and shallots and set some aside for garnish. In batches, puree the tomatoes along with the cucumber, pepper, shallots and garlic, then pass through a sieve into a large bowl. Season with freshly ground black pepper and ground cumin and stir well. Serve with a topping of chopped vegetables, a sprinkle of cumin and a crumble of sea salt. You can vary the quantities of vegetables. 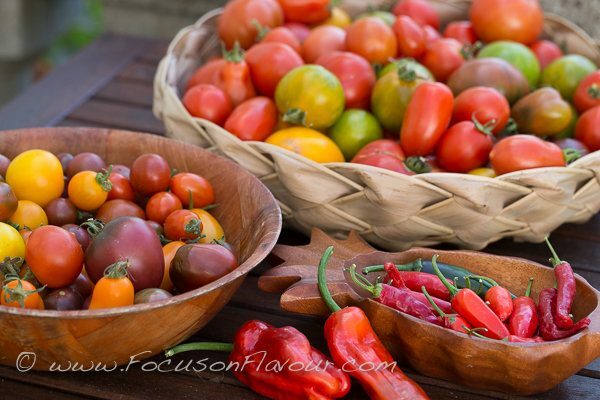 If your tomatoes are not sweet and ripe, a dash of sherry or balsamic vinegar may enhance the flavour. If you don't have time to get the soup really well chilled, serve with a couple of ice cubes floating on top. For non-fasters, you can add croutons or garlic breadsticks. For a more substantial meal, add chopped hard-boiled egg as a garnish too. 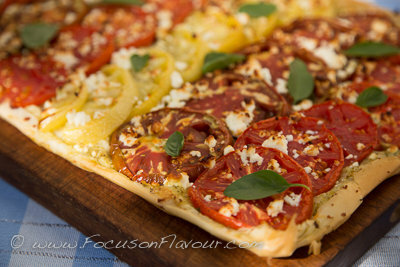 This recipes combines some of my favourite summer ingredients – tomatoes and basil, with filo pastry and feta cheese – to make a delightful starter when entertaining, or a yummy fast day meal. Recipe serves 4 as a main course (380 calories) or 8 as a starter (190 calories). Lay as sheet of filo on the paper and brush lightly with oil. Repeat until all 6 sheets of pastry have been used. Turn over the edges to make a neat outer rim. Brush the pesto evenly over the top, then crumble over half of the feta cheese. Season with salt and pepper and sprinkle over the remaining feta cheese. Bake until the pastry is crisp and golden, about 30 minutes. Cool in the pan then transfer to a board. 8 servings of 193 calories each, or 4 servings of 386 calories.